Boost your game and PC lifespan while keeping it in top shape! Maximizes your system performance to give you higher frames per second, by automatically shutting off unnecessary processes and applications when you’re gaming, and resuming them when you’re done. What does My Faster Game do? My Faster Game is a simple yet powerful solution for PC speed up to get the absolute best performance of your system and games. With just one click, It automatically cleans unnecessary Windows services and processes, unloads unused data from RAM, intensifies CPU performance and focuses all its resources purely for gaming in a few seconds and without any reboot. My Faster Game does not overclock your hardware or change your Windows Registry and system settings. It is 100% safe. My Faster Game is another freeware from YL Computing. All users can download it, use it, update & upgrade it and get basic technical supports for free. 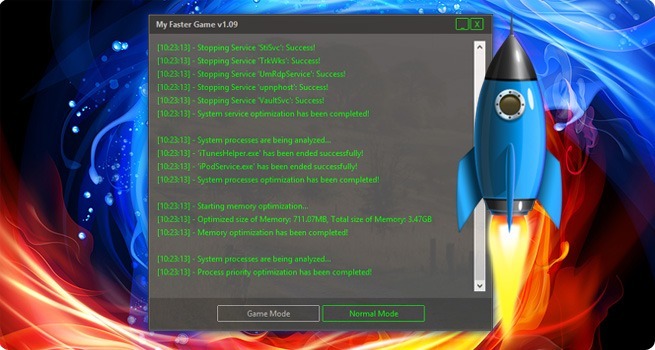 My Faster Game can optimize your PC, close background processes and unnecessary Windows services easily. With "Game Mode" button, you can speed up your PC game by one click. System Optimization module in My Faster Game absorbs and strengthens the same function in WinUtilities. Now it's more in line with the needs of game environment. My Faster Game can optimize the Memory Management for Windows and speed up the video game performance. If you meet any problem when you use My Faster Game, please send your problem to support@ylcomputing.com. We will reply to you and solve your problem as soon as possible. Do you want to buy Ultimate 24x7 Email Help - Only $9.9 (1 Year/ All freewares)?